2 bedrooms, 2 baths 1-2 &3-4 guests have different rates Read rates carefully. The views, privacy, comfort, and romantic ambiance of this intimate, elegant villa will delight you. Clothing Optional. Clinging to the hillside above Cruz Bay, Perelandra's breathtaking views sweep from the deserted cays nestled in the Windward Passage to the sailboats skimming through Pillsbury Sound to the spectacular sunsets resting upon St. Thomas. Later in the evening, St. Thomas' twinkling lights provide a romantic backdrop to your evening. The villa's perfect location offers proximity to Cruz Bay with its ferries, restaurants, and shops -- and to the world-famous National Park beaches of the North Shore while also providing complete privacy among lush landscaping. Glass tiles set in the vaulted ceilings bathe the living areas in light. Bedroom and great room doors open out onto two levels of wrap-around decks and verandas which, in turn, lead to the beautiful, refreshing swimming pool -- perfectly sized to be large enough to cool off and exercise in (10 x 18) but small enough to warm up quickly in the sun. While the pool area provides beautiful views of the ocean and St. Thomas, others can not view you as it is surrounded by garden walls and verdant foliage and flowers. Perelandra is very-well provisioned. Its kitchen provides everything you'll need to fix snacks for the beach, to make your own Caribbean drinks to sip poolside or while watching the sunset, or to prepare that romantic dinner for just the two of you. Special kitchen features include a large side-by-side refrigerator with ice-maker, range with built-in griddle, chef-quality pots and pans, and designer dinnerware. Additional amenities also include a full size washer and dryer, 2 tv's, many games, CDs, DVDs, videos, phones upstairs and down with answering machine, beach chairs and towels, picnic coolers, beach bags. See the extensive list below of all additional amenities provided for your comfort and convenience. All items are top quality. Perelandra is perfect for a romantic interlude for the two of you, for two couples vacationing together (bedrooms are equally desirable), or for a family with children. Don't forget to watch our new video to see it all. My husband and I were lucky enough to buy this beautiful villa. We want to share it with you. We have been coming to St. John for years and think it is the most beautiful place on earth. I know you will love Perelandra and St. John. Who wouldn't want to own a piece of Paradise? We looked at lots of houses on the island and Perelandra was the perfect villa for us. The view and location were the reasons we bought this villa. We upgraded the house and now it is perfect. We're Green! Solar panels help provide the electricity in our villa. Spectacular unobstructed views surround you. Watch sailboats skim across crystal-blue Pillsbury Sound in the morning or look towards the deserted cays on your right or left, nestled in Drake's Passage; enjoy incredible sunsets together, then be mesmerized by the gathering dusk as it melts into the twinkling night lights of St. Thomas. One of the very best views in all of St. John! Stainless steel refrigerator and gas stove. Upgraded kitchen cabinets. Fully stocked with dishes, glasses, pots and pans, cooking utensils and small appliances. Many videos & DVDs some family films included. (2) Cut coral tile decks and comfortable outdoor furniture. There is a screen porch with additional dining and seating options. We loved the beauty and comfort of the home. Perelandra is a beautiful property located close to town , ferry dock, Starfish grocery and great beaches. The home was well equipped and the views are amazing! Super clean and comfortable. We will return! You were such a wonderful guest to work with and I’m so glad you enjoyed our island home. Everything you wrote about is why we love Perelandra so much. You are welcome back anytime. A perfect home away from home. Delightful accommodations. 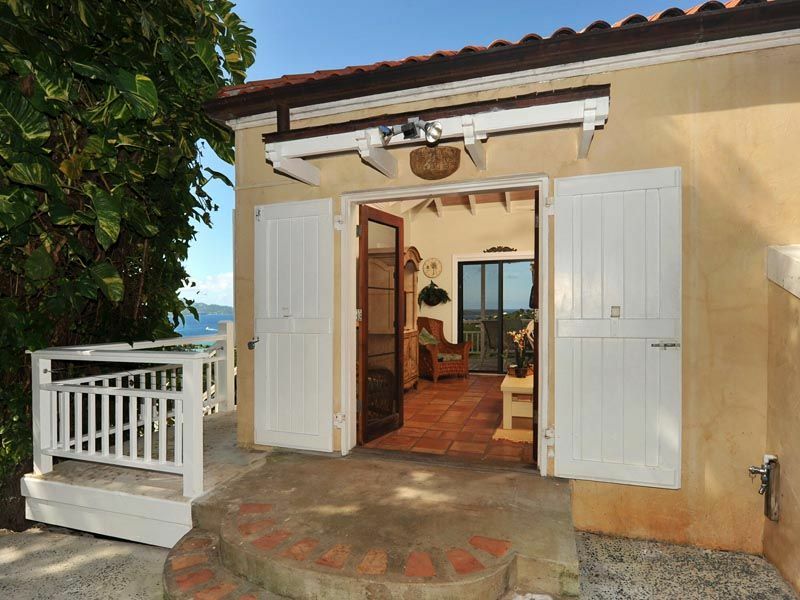 The spacious living room and outside deck with a smashing view of Cruz Bay were highlights. The inviting pool called for early morning swims and a cooling dip before dinner. With temperatures in the high 70s and low 80s there was no need to use the air conditioners. The Cimmaron Property Management people were helpful in answering our questions and offering service when needed. We had such an amazing vacation here! It was a beautiful Well kept home with the best views. Like the other reviews it seems like there is no one else around. Can’t believe it’s only minutes from town. Everyone involved was so nice and easy. I didn’t have to contact anyone the whole time because everything is laid out for you and we had absolutely no problems. I could sit on that porch and go nowhere and be so happy. The house has everything you need plus. Would love to stay there again! Oh yes, that view from the deck is one of the best things about Perelandra. When I am lucky enough to be there, I have my breakfast out there each morning. I never get tired of that view. Perfect spot for the four of us. Lovely house with gorgeous views of Cruz Bay. Close to Cruz Bay and North Shore beaches. Well-equipped and we’ll-managed. We would definitely stay here again. My family stayed at Perelandra for 5 days in early July (we caught the tail end of Carnival!) and I can't say enough about how nice the villa was. We were a party of 5 (no pun intended for those of you old enough to remember the show) and my older daughter and a friend took stayed in the downstairs bedroom, my younger daughter slept on the pull out in the living room and my wife and slept in the upstairs bedroom. The separation of the space is great. We did not feel cramped at all. In addition to the nice separation of the indoor living space the outdoor decks and patio are perfect. We spent almost all of our non sleeping time at the house outside. The views are awesome! And the screened in porch and shaded deck on the lower level provide an easy way to take a break fro the sun. Speaking of the outdoor spaces - the pool is great! And, the views from the pool are perfect. The villa it self is in great shape. The kitchen is well stocked and everything we needed was there. Perelandra is stocked with plenty of beach chairs, beach towels, and coolers. The location of the villa is great - just a short drive to Cruz Bay and the North Shore beaches. The villa also gets nice breezes. We stayed in early July and the house was perfectly comfortable with the window and sliders open and the ceiling fans on. We would use the AC in the bedrooms for a short time each evening but would turn it off when the rooms cooled down. The washer and dryer was a also a nice convenience. We've been to St John many times over the last 20 years and I would definitely stay in Perelandra again. Once you come to St. John you know you want to come again and again. Thank you for choosing Perelandra for this trip. I’m glad you like our villa so much. We try to have everything our guests need and to keep it fresh and attractive. Not hard with those views and sunsets. Please come back. You were terrific guests. Couldn’t have been happier with our decision to stay here - can’t wait to come back! Perelandra has the best location on the best island in the Caribbean. St. John is unique among the Caribbean islands because it is the only one that is 2/3 National Park--providing you with rare access to pristine beaches and water for swimming & snorkeling as well as miles of nature trails to hike. After a days recreation, come home to relax at Perelandra. Sitting on Perelandra's deck with an expansive view of the turquoise ocean and surrounding mountainous islands, surrounded with fragrant tropical flowers & chirping yellow sugarbirds, watch the brilliant sunsets as day turns into dusk, and then linger a bit longer & watch the twinkling lights of St. Thomas appear as the tree frogs begin your evening serenade. Please read the rate chart carefully. There are two different rates for 1-2 guests and 3-4 guests. High season Rental for 1-2 people is $3,250.00 and for 3-4 people is $3,750.00 plus tax. Low Season Rental for 1-2 is &2,250.00 and for 3-4 people is $2,500.00 plus tax. . Payment is either by check, Paypal - person to person or credit card using Square with the 4% credit card fee paid by the guest. Instant quote is not accurate. Extra charge for guests over 4. I will consider shorter stays during low season.